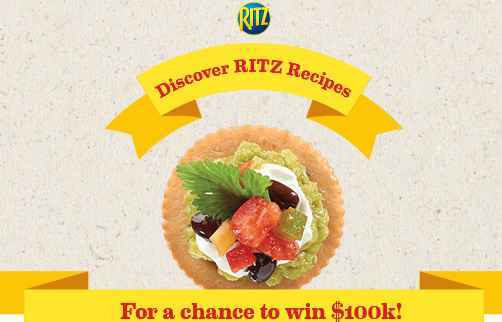 Enter the Top Your RITZ Scan Sweepstakes now through July 15, 2018 at Ritzscan.com for your chance to win grand prize of $100,000 or other exciting daily prizes. How To Enter The Ritz Scan Sweepstakes At Ritzscan.com? Visit this link:Ritzscan.com to go to the sweepstakes page. Upload the Ritz logo which can be found here:http://bit.ly/2ggcyp3. Now follow the online instructions to register by entering all information requested on the registration form. Prizes You Could Win: One (1) Grand Prize: A $100,000 check. ARV: $100,000. One hundred twenty-three (123) First Prizes (one (1) per Daily Entry Period): A $100 Visa® Prepaid Reward. Visa® Prepaid Reward. Card is issued by The Bancorp Bank, Member FDIC, pursuant to a license from Visa U.S.A. Inc. ARV: $100. When To Enter: The Top Your RITZ Scan Sweepstakes begins at 12:00 am ET on March 15, 2018 and ends at 11:59 pm ET on July 15, 2018. Sponsor: This sweepstakes is sponsored by Mondelez Global LLC, 100 Deforest Avenue, East Hanover, NJ 07936.